The People's Bank of China would like to lower the interest rate to cushion against potential adverse impacts from the escalating trade war and unwind some harsh damages (e.g. bonds defaults) caused by financial deleveraging reforms in 1H18. 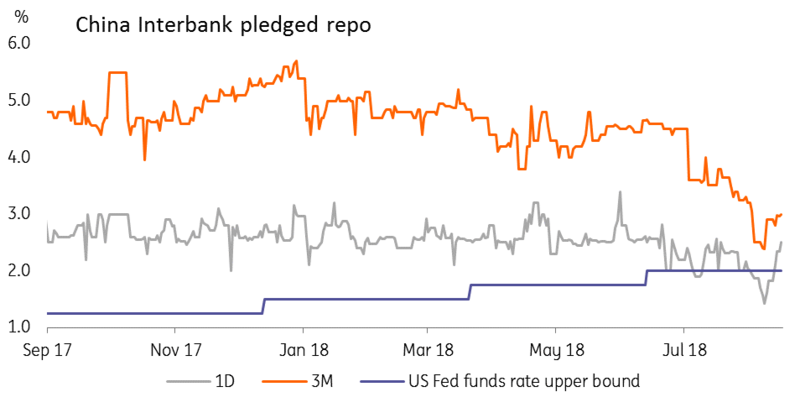 However, when the 1D interbank pledged repo and overnight SHIBOR fell below 2% - which is the level of the US's Fed funds rate upper bound - it triggered capital outflow concerns from the inverted China-US interest rate spread. This could be the reason the central bank has guided the interbank interest rates higher than the 2% level after a sharp fall in the first week of August. The central bank also guided the interest rate on 3M government deposit auction stable at 3.7% in August, the same as July after a sharp fall from 4.73% in June. As we expect another rate hike from the Federal Reserve in September, China's interest rate could be lower than the US again by then. PBoC will have to live with this negative spread because the economy needs lower interest rates to support investments and economic growth in this ongoing trade spat. The Chinese central bank should have known if it shut down cross-border capital flow channels, then the chance of substantial capital outflows would be small even it guides interest rates lower, and the yuan weakens further due to the strong dollar. This could be the reason behind the policy to stop capital outflows via interbank accounts set up in the Shanghai Free Trade Zone as reported by the media on 17th August 2018. We see this as a firewall to prevent capital outflows, give more room for a lower interest rate and a weaker yuan in the coming months when the trade war escalates. 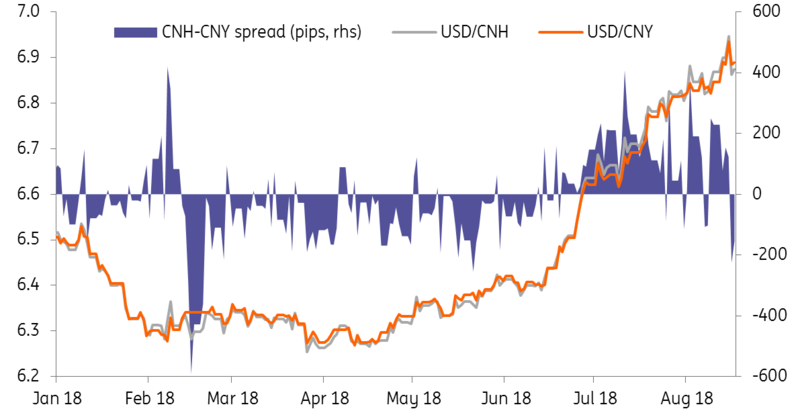 USDCNH may not fully reflect the offshore market reaction of this policy, but USDCNY movements would be more indicative than the USDCNH from here onwards, and we believe the PBoC would allow USDCNY to follow the dollar trend broadly. Once the Fed hikes, the dollar should maintain its strength even after the recent emerging market situation stabilises. We believe the US has invited China to a fresh round of trade negotiations but the low official ranking of representative from both sides signals the chance of a positive result, or of any result, from this negotiation is small. Given that China isn't going to give way if the US doesn't scale back its tariffs, we think the trade war will escalate, and the yuan would weaken against the backdrop of a strong dollar index. As USDCNY touched 6.9348 on 15th August 2018, passing 7.0 in 2018 looks increasingly likely.